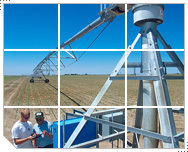 Energy Estimator for Irrigation is the third of several tools from Natural Resources Conservation Service (NRCS) developed to increase energy awareness in agriculture. This NRCS energy consumption tool enables you to estimate energy cost of pumping water in the irrigation operations on your farm or ranch. NRCS technical specialists have developed these cost estimates based on irrigation methods for predominant crops in your state. This tool does not provide field-specific recommendations. It evaluates options based on user input.